First you will need to go to ‘PicMonkey‘ online. It is a free editing software program with everything you will need. Once there just click ‘edit’ and open the chore chart you would like to add a name to. (You will need to find where you saved it when you downloaded the PDF). Follow the pictures and instructions below to add your child’s name to their chart…. * All the boy colored chore charts look good with white text and the code is ‘ffffff’ The girl chore charts have 2 other colors: Grey code ‘99949a’ and Pink code ‘f06eaa’ Just type those codes into the font color code area with your font highlighted. Once you are done adding your Child’s name to their chart, simply print on cardstock(thick paper) and laminate if desired. 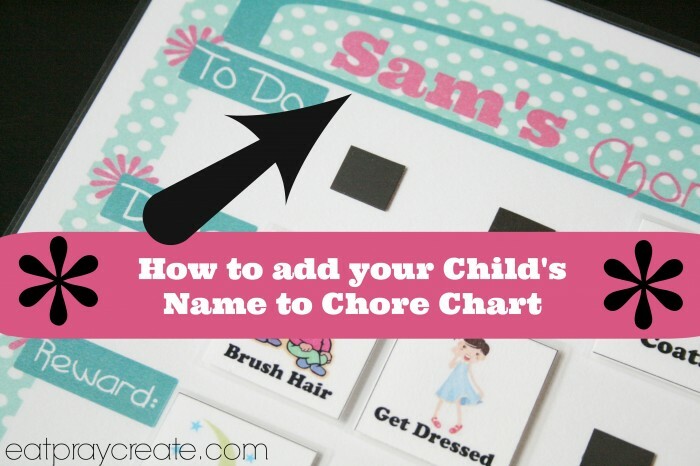 You now have a custom made chore chart for your little helper! **Looking for our FREE PRINTABLE CHORE CHARTS? Go HERE to learn more and download your free printable Chore Charts!